The Animal Medical Center of Wentzville is a thriving veterinary practice in one of the fastest-growing cities in Missouri just west of St. Louis. The mission of owner Dr. Erin Quigley and her team of compassionate doctors and staff is not only to provide quality pet care but also to partner, educate and support their clients through the various life stages of their family pet. The vet clinic has experienced steady, consistent double-digit growth, so we worked with their team to build on that strong foundation. We developed consistent branding to coordinate with their existing logo and worked with their leadership team to create content that showed what set them apart from competing vets. The result is clear communication, a more personal approach, and tools to help staff convert more leads into patients. AMC Wentzville is located in the fastest growing city in the state. Over 50% of residents have pets. 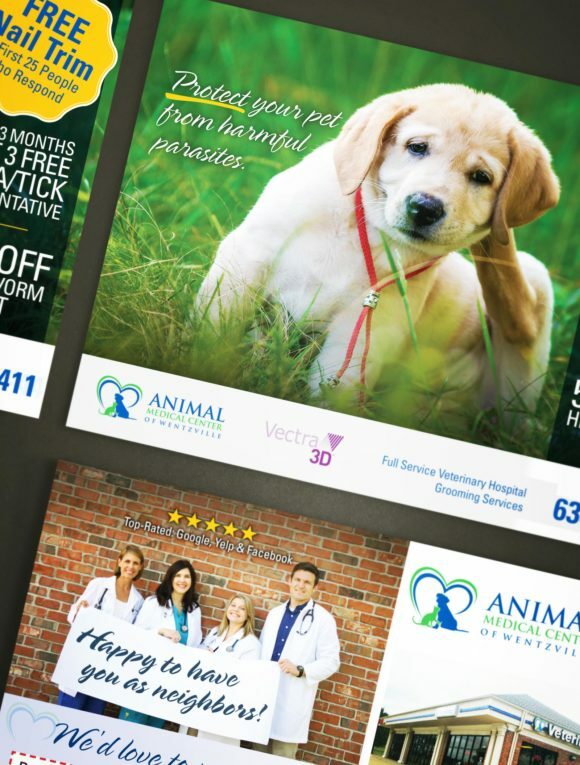 The clinic had mostly reactive strategies in place, and we focused on a proactive outreach campaign using direct mail, email and social media. This built on the clinic’s excellent reputation and online reviews, while reaching out to new prospects.